We have a free programme of events taking place throughout the project. Walks, talks, workshops, storytelling & more! Within these Walls -A journey through the inside spaces of HMP Holloway combining still images with oral histories of former inmates. 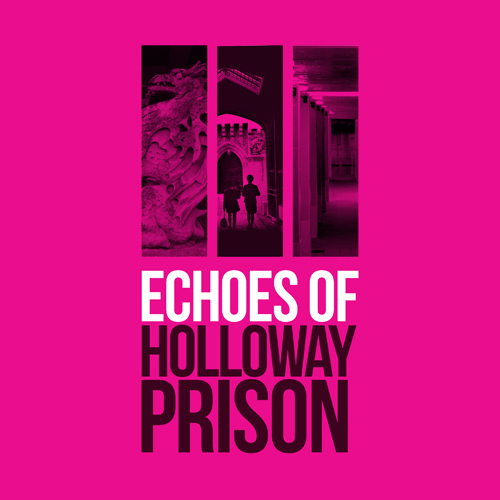 Echoes of Holloway Prison –A film telling the story of the prison through the voices of those who were held there and worked there. Postcards from Prison- Erika drew a postcard every day before, during and after her imprisonment at HMP Holloway. This film tells her story through some of the postcards. WARNING: These films include strong language and stories which viewers may find upsetting. Not suitable for under 18s. outside and about the prison itself. What did suffragettes experience at Holloway? How have women fought the system when they had no power? What will happen next on the Holloway Prison site? Discover more of our free events programme here. The Echoes of Holloway Prison Exhibition ran at Islington Museum, from the 13th of July to the 8th of October 2018. Discover the varied events programme which accompanied it below and discover more on our blog. Islington has been a key battlefield in the fight for women’s rights. This 90-minute walk, led by a local Islington and City Guide, introduced visitors to the suffragettes held at Holloway in their campaign for the vote, their attempt to blow up the prison and the site of the first birth control clinic for women. Constance Markievicz: Suffragette! Socialist! Soldier! Pardoned from a death sentence after the Irish Easter rising in 1916, Constance is sent to HMP Holloway where she meets Kelly McCoy. It’s 2015 and Kelly got 3 months for stealing baby milk…She’s off the drugs and away from her abusive boyfriend and alcoholic mother. What can these 2 women do for each other? Written and directed by Laura McCluskey, this piece includes graduates of Clean Break and was performed at Islington Museum. Resident artist and musician Hannah Hull led a tour around the outside perimeter of Holloway Prison. Visitors joined her to explore the physical and social relationship between the prison and the local area. Holloway Prison has always been a site of protest, from the imprisonment of the suffragettes to the recent protests around its closure.Visitors joined us to discover more about the prison’s relationship with protest and to learn how to create their own screen-printed protest banner. Led by Carly Guest and Rachel Seoighe of Middlesex University, this workshop explored photographs taken of Holloway Prison after it closed. Investigating the images, we discussed what we can learn about prison life and how women held at Holloway made the space their own. The group spoke about institutional spaces, women and punishment, memory, the potential and limits of photography, and visual research methodologies. In May 2017, North London Sisters Uncut occupied Holloway Prison’s Visitors Centre, claiming the space for the local community. In this session, a representative from Sisters Uncut spoke about the act of reclaiming Holloway Prison and explored ways to create radical community spaces. Storyteller Dani took four groups of under 5’s on a journey back in time to meet some real life heroines. In a playful and interactive session, children discovered the meaning behind the suffragette colours, how the suffragettes fought for their rights and learnt about the suffragette who knew jujitsu. Family Day: Inside Out Holloway! Inspired by the badge awarded to all suffragettes held at Holloway Prison, artist Alice May Williams led two family workshops exploring the history of protest at Holloway, inside and out. Families created their own protest banners, badges and flags, about issues important to them. Youth Workshop: Who is Criminal Now? Young people at Platform Youth Hub worked with Echoes of Holloway Prison staff and socially engaged artist Alice May Williams to explore Holloway’s stories and produce creative responses. Their exhibition is currently on display at Islington Museum. Find out more here.